Figure 2-1.Progressive hardening torch tip. Home > Construction Training Manuals > Steelworker Volume 01 > Figure 2-1.Progressive Hardening Torch Tip. Figure 2-1. - Progressive hardening torch tip. Tips are produced that can be used for hardening flats, rounds, gears, cams, cylinders, and other regular or irregular shapes. In hardening localized areas, you should heat the metal with a standard hand-held welding torch. Adjust the torch flame to neutral (see chapter 4) for normal heating; however, in corners and grooves, use a slightly oxidizing flame to keep the torch from sputtering. You also should particularly guard against overheating in comers and grooves. If dark streaks appear on the metal surface, this is a sign of overheating, and you need to increase the distance between the flame and the metal. For the best heating results, hold the torch with the tip of the inner cone about an eighth of an inch from the surface and direct the flame at right angles to the metal. Sometimes it is necessary to change this angle to obtain better results; however, you rarely find a deviation of more than 30 degrees. Regulate the speed of torch travel according to the type of metal, the mass and shape of the part, and the depth of hardness desired. In addition, you must select the steel according to the properties desired. Select carbon steel when surface hardness is the primary factor and alloy steel when the physical properties of the core are also factors. Plain carbon steels should contain more than 0.35% carbon for good results inflame hardening. For water quenching, the effective carbon range is from 0.40% to 0.70%. Parts with a carbon content of more than 0.70% are likely to surface crack unless the heating and quenching rate are carefully controlled. Figure 2-2. - Progressive hardening. hardening produces a hard case that is highly resistant to wear and a core that retains its original properties. Flame hardening can be divided into five general methods: stationary, circular band progressive, straight- line progressive, spiral band progressive, and circular band spinning. 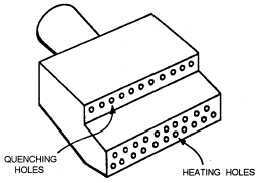 STATIONARY METHOD.-In this method the torch and the metal part are both held stationary. CIRCULAR BAND PROGRESSIVE METHOD.-This method is used for hardening outside surfaces of round sections. Usually, the object is rotated in front of a stationary torch at a surface speed of from 3 to 12 inches per minute. The heating and quenching are done progressively, as the part rotates; therefore, when the part has completed one rotation, a hardened band encircles the part. The width of the hardened band depends upon the width of the torch tip. To harden the full length of a long section, you can move the torch and repeat the process over and over until the part is completely hardened. Each pass or path of the torch should overlap the previous one to prevent soft spots. STRAIGHT-LINE PROGRESSIVE METHOD.-With the straight-line progressive method, the torch travels along the surface, treating a strip that is about the same width as the torch tip. To harden wider areas, you move the torch and repeat the process. Figure 2-2 is an example of progressive hardening. SPIRAL BAND PROGRESSIVE METHOD.-For this technique a cylindrical part is mounted between lathe centers, and a torch with an adjustable holder is mounted on the lathe carriage. As the part rotates, the torch moves parallel to the surface of the part. This travel is synchronized with the parts rotary motion to produce a continuous band of hardness. Heating and quenching occur at the same time. The number of torches required depends on the diameter of the part, but seldom are more than two torches used.